For people in Snowy Mountains, Australian Capital Territory and parts of Southern Tablelands and South West Slopes Forecast Districts. Issued at 4:42 am Tuesday, 12 February 2019. Vigorous west to northwesterly winds are being generated ahead of cold front approaching from the west. Winds are expected to ease this evening as the front passes through the region. DAMAGING WINDS are expected about parts of the Snowy Mountains, Australian Capital Territory, South West Slopes and the Southern Tablelands from Tuesday morning. DAMAGING WINDS, averaging 60 to 70 km/h with peak gusts in excess of 90 km/h are expected along parts of the southern ranges from Tuesday morning until the evening. DAMAGING WINDS, averaging 80 to 90 km/h with peak gusts in excess of 120 km/h are expected from Tuesday morning until the evening. 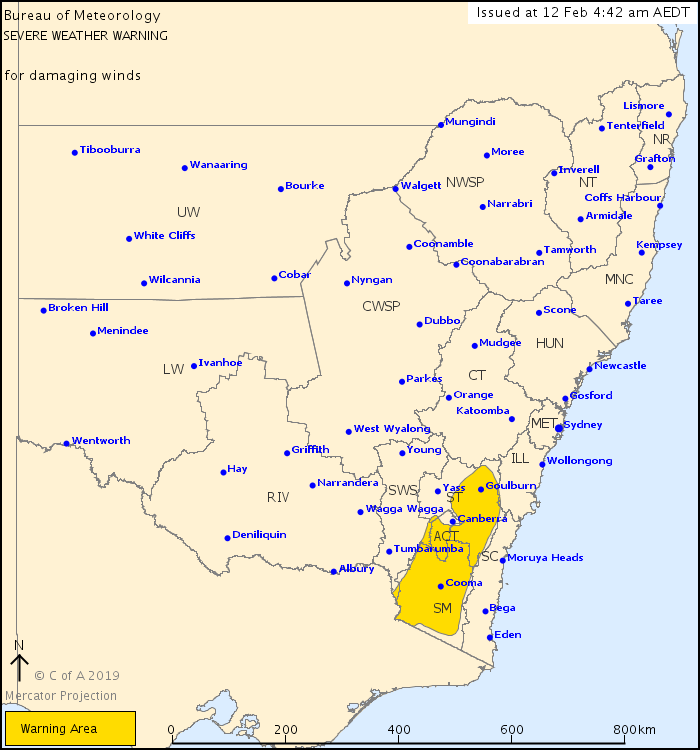 Locations which may be affected include Thredbo Tops, Braidwood, Goulburn, Cooma, Bombala, and Adaminaby.